Chooks and a tassle. Whoever thought you would see that one one of my creations this year? 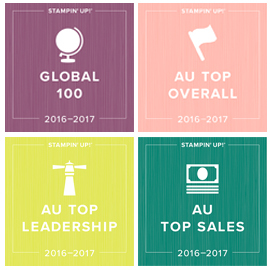 Enter the new Stampin' Up! set Hey Chick, which is one of this years free offerings with a $90 order during Saleabration. I was born and bred in the country and raised on farms. I have lots of memories and funny stories about the farm chookpen, like when the rooster chased my brother out of the chookpen and he accidentally flattened my sister (who was shaken but ok) on the other side of the 'just propped up with string' chook pen gate. We still laugh about that. So when I saw Hey Chick, I could definitely see the humour. I watercoloured each of the chooks (using Daffoldil Delight, Calypso Coral and Early Espresso) and then fussy cut them to layer a little. I've use a base of Tip Top Taupe, and the paper / embellishments are from the Cupcakes and Carousels product suite in the 2017 Occasions Catalogue. You can check out this stamp set and the other products used in today's card, at the end of the post. All you need to do to get this stamp set absolutely FREE, is place a $90 order in my online store and choose this as your gift when you check out. January's hostess code is EDSZMZJK. Use this code when you place an online order to qualify for a free gift sent to you mid the month after your order. Check out this months specials and 3 ways to order with me. Don't miss the amazing sign up deal during Saleabration - up to $414 worth of product for $169 and you can join just for yourself! Shop with me online 24/7 or by mail / email and become my VIP. 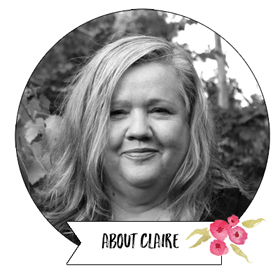 You will enjoy free catalogues, exclusive customer only rewards, hostess code gifts for online orders (January's Hostess Code is EDSZMZJK), tutorials and inspiration (different to my blog newsletter). 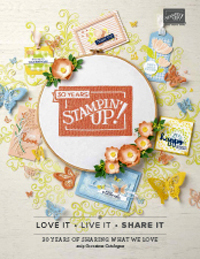 The Swirly Bird bundle in the new 2016 Stampin' Up! Annual Catalogue has been soooooooo popular! Being Christmas in July month, I wanted to wanted to make a Christmas card using the bundle for my stamp club ladies and I was really happy how this turned out. It would be super simple to make a stack of these too! The This Christmas Specialty Designer Paper is gorgeous too. You get 26 sheets in a pack - 4 each of 6 designs. Earn a $9 voucher to use between 2-31st August, with each $90 you spend in a single order between 7th and 31st July. You will automatically be emailed the coupon code after your order - make sure to print it out and/or write the code down. You can still use my monthly hostess code too, so it really IS bonus month. Place an online order with me using my monthly hostess code and you will automatically receive a free git in the mail with a hand made card as a thank you the following month. Depending on the value of your order, gifts can include embellishments, embossing folders, DSP, cardstock or stamp sets. For more information, including how to enter the hostess code, click HERE. Join a fabulous Australian wide team of hobby and business demonstrators with great online support - we are all about fun, friendship and support! More information HERE.